Rich, creamy chocolate paired with aromatic hazelnut can only result in an indulgent treat that goes by the name Magnum Hazelnut Luxe. The latest chilly dessert from Magnum was unveiled yesterday evening at a glitzy Roaring Twenties-themed event held at Mandarin Oriental Hotel in Kuala Lumpur. The new hazelnut ice cream, carefully crafted by expert chocolatiers, is made from dark hazelnut paste encased in Magnum’s signature Belgian milk chocolate, topped with caramalised bits of hazelnut. Go nuts for hazelnut and loco for choco with the new Hazelnut Luxe. Annemarieke de Haan getting ready to take a bite of the new ice cream. “Pleasure is often considered a desire rather than a necessity. 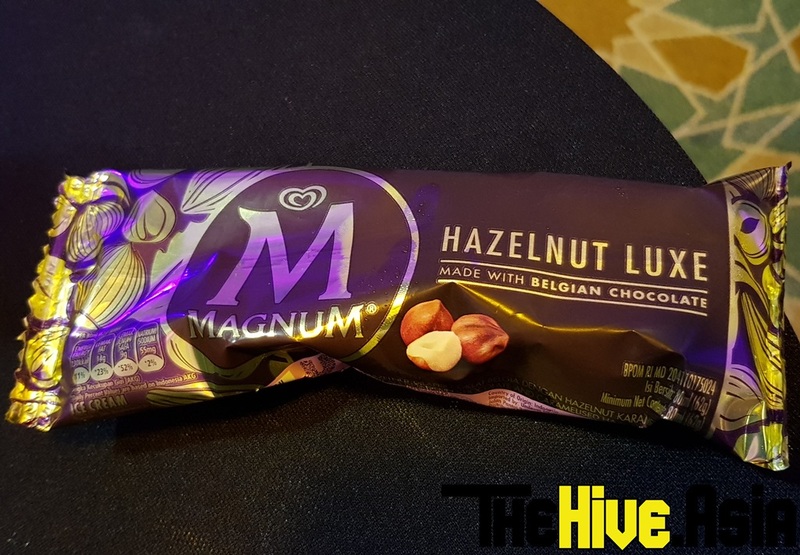 We at Magnum believe that pleasure is yours for the taking, that no matter who or where you are, pleasure is essential in your life,” said Annemarieke de Haan, General Manager of Unilever Malaysia and Singapore, during her welcome speech. Aside from the unveiling of the new ice cream, there were also other activities held at the event. Guests, or Pleasure Seekers if you may, could be seen flocking two big tables where they could try their hand at decorating their own chocolate bars. Some of the chocolate designs guests could try their hand at making. Chocolate enthusiasts gathered around expert chocolatier Chef Amanda Lim. Those who were more interested in learning about the art of chocolate-making could be seen crowded around a table where Chef Amanda Lim from Barry Callebaut was demonstrating the intricacies of chocolate tempering. The beautiful Hannah Tan plays host for the evening. Guests dressed to the nines in their best Flapper getup also got to capture the moment at the photobooth. Chocoholics or sweet-toothed foodies who missed out on this event, don’t fret! You can get your chance to savour the luxurious Magnum Pleasure Lounge experience at Highstreet, 1 Utama, from 18 to 22 April 2018.
with the rich, creamy taste of Hazelnut Luxe.